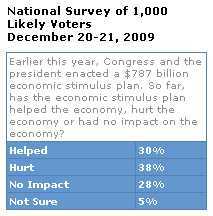 Barack Obama began his presidency by fundamentally misunderstanding the economy. There is absolutely no evidence whatsoever that he’s understood it one iota better since. Let’s start where Obama started, with his massive stimulus. You know, the stimulus that everybody on the left said would cost “only” $787 billion. It didn’t take long before it suddenly cost “only” $862 billion. 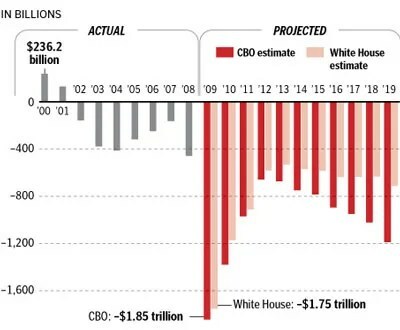 And by the time it’s all said and done, the real total cost of the stimulus which will actually be a $3.27 trillion porker before all is said an done. Obama sold his porkulus boondoggle as something that would solve the unemployment problem. It didn’t. In fact, it actually CONTRIBUTED to high unemployment, when one looks at the evidence. In other words, by Obama’s very own measure, unemployment is HIGHER than it would have been if he’d done NOTHING. Well, at least they didn’t say “unexpected.” Like pork to chicken as “the other white meat,” we can call the word “surprise” the mainstream media’s “other favorite adverb” to describe Obama’s unemployment rate. Economists suggest the spike in claims could be related to the Easter holiday. Each week, it seems, there’s some sort of anomaly that affects the new jobless claims — the big February snows, the March snapback from the big February snows, the Easter holiday — so it’s hard to get a good handle on the real jobless picture in the U.S. When excuses fail, the left resorts to demagoguery and fearmongering. We might see a recovery. Count how many times the U.S. had a recession we never got out of. 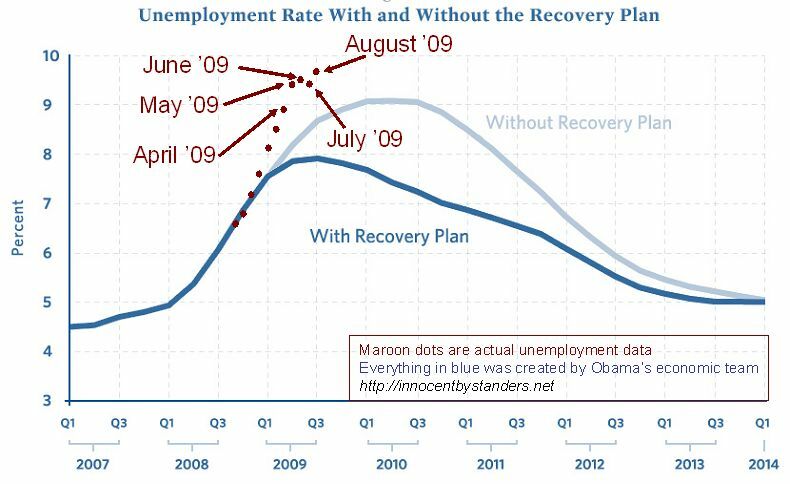 But even by Obama’s own analysis, any recovery will be a “jobless recovery,” with joblessness remaining shockingly high throughout his presidency. And the grim scenario of a “W-shaped” recession looms larger and larger. Does This look like an Economic Recovery to You? A failed $trillion stimulus and few, if any new jobs is Obama’s economic legacy! Did you see these headlines last week? California’s unemployment hit 12.6% and Florida’s is 12.3%. And where was Obama when this dire news was about to hit? He was in Florida telling spaceworkers he was canceling much of the manned space program which means a loss of thousands more of the most highly skilled jobs in both Florida and California’s aerospace industries, not to mention Texas. The past nine months Obama has talked about little else other than health care. Meanwhile, millions of Americans remain out of work. If a Republican President were in the White House we’d read daily stories about the toll of human suffering wrought by the President’s economic policy. But with Obama in the White House the “news” media hardly notices unemployment or discusses the lack of any effective jobs policy coming from Democrats. While the President recently said the economy had “turned a corner,” it’s hard to tell that from looking at the job situation across the U.S. According to the latest data from the U.S. Department of Labor, and the chart below, through March 2010 a total of 48 out of 50 States had seen net job losses since the President signed the Democrats’ stimulus plan into law in February 2009. The data show that only Alaska, North Dakota and the District of Columbia have seen net job creation since then. And (other than the perhaps predictable exception of D.C.) those states that have seen some increases in jobs are still well short of the growth the White House originally forecast. Additionally, over 3 million jobs have been eliminated since the Democrats’ stimulus, unemployment remains stuck at 9.7 percent instead of 7.4 percent and falling as Democrats predicted, and a record 16 million Americans are out of work. 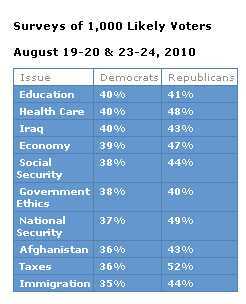 To see how the Democrats’ stimulus has failed your state, see the table below. California’s unemployment rate is now the highest it has ever been since 1940 and the Great Depression. The California jobless rate of 12.6 percent for March was slightly higher than the 12.5 percent level reached in February. Still, that was the worst California unemployment level in nearly 70 years, stretching back to the Great Depression. December 1940 marked the last time California staggered to the dismal milestone of a 12.6 percent jobless rate. It was 9.3% when Obama took office. Which is to say, unemployment has increased by 35.5% since Obama began to “fundamentally transform” things. California is a huge chunk of the U.S. economy. It is the eighth largest economy on the planet all by itself. And it represents 13% of the entire U.S. economy. In every single other recession the U.S. has ever had, it was California that led the country out. This time, under Obama, it is California which is lagging the farthest behind, with only two states having a higher level of joblessness. Right now, California is poised to go the way of Greece – and Greece fell into a black hole of total economic collapse. And Florida – the fourth most populous state with the fourth largest economy in the nation – isn’t in much better shape. It’s unemployment rate under Obama’s “Wonder Boy” management is the highest it has ever been in history. MIAMI — Florida’s unemployment rate reached an all-time high for the second straight month at 12.3 percent in March. The figures released Friday by the Agency for Workforce Innovation show a marginal increase from February’s rate at 12.2 percent. If these two giant states’ economies go boom – and it is very possible indeed that they WILL go boom – then the U.S. economy is doomed. They are too big to fail, and too big to save. The Louisiana Purchase? The Cornhusker kickback? You aint seen NOTHING yet! Get ready for the Mother of All Bailouts, suckers. All this to say, it’s time to ponder the previously content-free Obama campaign slogan “Hope and Change.” “Change” would be a return to the Great Depression by the same policies that the president pursued during the LAST Great Depression. And “Hope” is hoping that history doesn’t repeat itself.